For many years the green algae (Chlorophyta) were the group thought to be most likely to have given rise to the land plants. 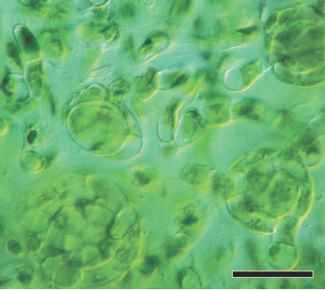 Today most regard the green algae and embryophytes together as a monophyletic group, the Viridiplantae, which consists of two monophyletic lineages, the Chlorophyta and the Streptophyta. Included in the Streptophyta are all embryophytes, that is bryophytes and vascular plants, and a distinct group of green algae traditionally known as the Charophyceae, which includes the Charales, Coleochaete, and the Zygnematales, among other taxa (Simon et al., 2006) (Chapter 4). Although the fossil record of the green algae in general is extensive (Chapter 4), fossils have thus far provided relatively little information about the steps involved in the transition to a land habitat. In contrast, studies of living green algae have produced an array of molecular and morphological data that underscore the phylogenetic relationships between these two groups. Based on multiple characters, the Charophyceae are regarded as the green algal lineage most closely related to land plants (Huss and Kranz, 1997; Nishiyama, 2007). This evidence was initially biochemical and ultrastructural (Mattox and Stewart, 1984), but more recently has included molecular sequence data (Kranz et al., 1995; Karol et al., 2001; Lewis and McCourt, 2004; McCourt et al., 2004; Qiu, 2008). The question remains, however, as to which of the orders within the Charophyceae—Charales or Coleochaetales—is more closely aligned to the land plants (Chapman and Waters, 2002), as several molecular analyses provide conflicting information (Karol et al., 2001; Delwiche et al., 2002; Lewis and McCourt, 2004). Based on comparative genomic analyses, Turmel et al. 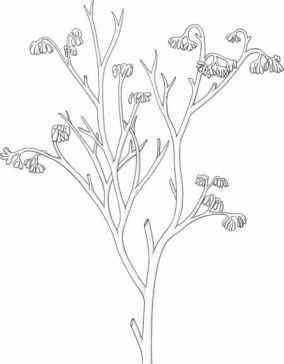 (2007) suggested that the Charales are sister to a clade which consists of the Coleochaetales, Zygnematales, and land plants. They note that the question of which particular group of charophycean algae is most closely related to the land plants is a complex one for which we still do not have a clear answer. McCourt et al., 2004). In at least one species, the zygote receives nourishment from placental transfer cells with wall ingrowths that increase the area in contact with the zygote (Graham and Wilcox, 1983) . This pattern is similar to the archegonial venter cells of lower embryophytes. The larger number of meiotic products (8-32) in Coleochaete has been suggested as an adaptation in competing for available substrate space (Hopkins and McBride, 1976). 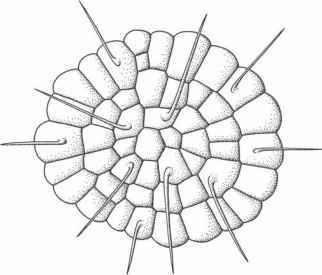 Sporopollenin in the inner wall of the zygote of Coleochaete and lignin in the thallus, perhaps functioning in an antimicrobial manner, add additional characters that have been used to suggest a relationship between this charophycean alga and early land plants (Delwiche et al., 1989).